[Chuckle] It seems like wherever I turn, I tend to hear about the tax law being bad and terribly complicated. What most people don’t know is that over 5,700 pages of the tax code are filled with directions on how to actually pay LESS TAXES. That definitely shocks a lot of people! I never thought of it that way. But why would the IRS take this approach? So what you’re saying is that the government is looking at the big-picture implications of tax incentives? Exactly. The government wants to increase tax revenues, but they also want the economy to grow so that people have jobs. They want other things to occur as well. They want the U.S. to be oil-independent; develop alternative energy sources; produce housing, particularly low-income; and they want us to grow food. So what the government has found is that the most efficient way to promote these and other growth policies is through the tax law. Can you elaborate further on this point? Look at it this way. If the government offers someone a small incentive, then what are they going to do with it? If that person is smart, they’ll take advantage of this windfall instead of the government making use of it. We already know that the government is not as efficient as the free market in terms of the efficient use of money. So it behooves us all to take advantage of these opportunities. In your book, I was struck by the story you told about the woman who viewed tax-favorable strategies for individuals and businesses as essentially cheating the government. Can you share more about that story and how it sets a tone for the overall context of your book? As the story goes, a client of mine was teaching some of the tax strategies he learned from us. He was having a meeting with a group of people where they were actually playing Robert Kiyosaki’s Cashflow 101 game. The topic of taxes came up because it’s an intregal part of the game. As my client was explaining how tax law essentially represents a series of incentives for all of us to reduce our taxes, a participant raised her hand and exclaimed that this would be devastating to the government. “Aren’t we obligated and don’t we have a duty to pay for all of the government services we are receiving?” Sadly, like many other people, she was unaware of the whole point of tax law which is to provide incentives that benefit entrepreneurs and investors. And as an aside, the government ultimately receives more tax revenue, not less from these scenarios. There is no doubt that some of this occurs. Many of these incentives are the result of effective lobbyists, or where someone has cut a behind-the-scenes deal. But then there are things like low-income housing credits, tax incentives for research and development and credits for solar or electric cars. Most people would probably agree with those types of incentives. Explaining the advantages behind these incentives is a major reason why I wrote the book. Michael, there are two different parts of our tax system. For starters, there is a legislative component which embodies the tax laws themselves. And then we have the administrative part which involves IRS enforcement activities deriving from those laws. So we should all be a little afraid of the IRS in their efforts to make sure that people don’t overstep the tax laws. At the same time, these checks and balances are a good thing because if there is no IRS, there is no compliance. That said, while the IRS is NOT your friend, the tax law IS! It’s the old notion that Congress giveth and the IRS taketh away. We should always keep in mind that the law is for you and the IRS is against you. There’s been lots of talk in the media of how recent Congressional budget cutbacks have severely weakened the IRS. Can you offer some perspective on what’s really happening here? It’s interesting. You can look at the IRS as having two divisions. There’s the Collection Division comprised of IRS agents and auditors who make sure that taxpayers are compliant. Then there’s the Service Division which encompasses the customer service and administrative folks. As in the case of any business, the IRS is faced with the question of what to do if they exceed their operating budget. In other words, should they cut the agents and auditors who are the revenue producers? Or should they eliminate bureaucrats from the administrative ranks? Like most private companies, they elected to do the latter, because if you cut the producers, you’ll be cutting revenue. Unfortunately, doing this has been very harmful to taxpayers. At present, only half of all phone calls to the IRS are being answered. So many taxpayer inquiries are not being responded to at all. Then there’s the tax practitioner’s hotline, where tax advisors like me used to have an efficient way to address pressing client issues with the IRS. This used to be a 5-minute phone call, but now we’re typically on hold for an average of 90 minutes before we can even get somebody on the line. How is all of this good for taxpayers? And what about issues of taxpayer fraud that we’re hearing in the media? The reason why fraud is occurring at such an alarming rate is becuase the IRS computer systems are so antiquated. Clearly, a sizeable investment ought to made to completely redo these systems. We’ve put tons of money into the ACA (Obamacare), but we’ve not made that same investment in the IRS, the very agency that actually collects the country’s revenue. That makes absolutely no sense! Why are so many Americans afraid of the IRS? Most Americans aren’t aware of the fact that there is nothing requiring an individual to talk to the IRS ever. So what should taxpayers do if they have a serious tax issue? Hire a tax expert. Because going up against the IRS is like playing one-on-one hoops against a college basketball player; it’s likely you’re going to lose every time. But if you hire LeBron James to represent you against that same player, you’re probably going to win. That’s the simple solution. Hire a professional to do the job, because it’s not wise to get involved in something you’re not good at. Of course, there are exceptions. But generally speaking, taxpayers tend to get emotional about these situations and lose sleep, irrespective of how many times they’ve tried to handle it themselves. For no matter how good you think you are, at some point there’s a good chance you’re going to screw things up. Once you’ve opened Pandora’s Box with the IRS, you’ll find they will start fishing in other places. The good news is that a competent tax advisor will know exactly what to say and do to get you the most favorable outcome. What tips do you have for identifying a competent tax preparer? For starters, avoid the notion that tax preparation is a commodity and that all tax professionals are the same. If you happen to be a W-2 employee without a side business and have no investments outside of a 401K then, yes, you can either do it yourself or have someone like H&R Block or Jackson Hewitt handle it for you. On the other hand, if you have a small business and/or real estate investments, it is better to go with a firm that has more experience and firepower. Again, don’t assume that all tax preparers are created equal, because they fundamentally just aren’t. I have to ask you, what’s it really like dealing with an IRS auditor? IRS auditors are just people like you and me, trying to do their best. But they have a pretty crappy job. My role when representing a client is to help that auditor be as efficient as possible in doing their job; to help them get to the real answers. If they happen to find something that is clearly wrong with our client’s situation, then we will admit it. On the other hand, if they start to overreach and are misguided in their findings, then I will take that to the end of the earth. There are times when their rulings are flat out wrong. In your professional opinion, what three tax strategies are most overlooked by Americans? The most important tax strategy I think many people miss is owning one’s own business. In fact, my book is really targeted toward entrepreneurs and investors, so we cover this quite a bit. I explain how the minute you begin owning and running a business, you can take advantage of some great benefits available to you through the tax law. What’s cool about this is that you can spend the same amount of money you were spending before, yet you’ll have a significantly lower tax bill. Every dollar you spend could be deductible in the right situation. For example, you can go to dinner and in one situation its deductible; in another, its not deductible. Same with driving your car. So I tell people all the time that the best kind of deduction one can have is a business deduction. Another tax benefit that people often miss out on if they have a business is the home office deduction. People say it’s not that big of a deduction except for the fact that when you have a home office deduction, the mileage deduction you get for your car nearly doubles. I often think back to all of the seminars I conducted over the years where I’ve posed the question, “Who here has ever had someone tell you not to take a deduction you were entitled to?” Typically, about 50% of the hands go up. I then ask them to leave their hands up if the deduction they were told not to take was the home office deduction. Invariably most of the hands remain raised. The primary reason is that years and years ago, the home office deduction used to be a big IRS red flag. However, since 1997 it’s really not been an issue. So here you have a legitimate deduction that your entitled to and you’ve chosen not to take it basically because your tax preparer is afraid of the IRS. This makes absolutely no sense. Yes, this is another deduction that most people fail to capitalize on. The law states that meals are deductible if you have a business conversation with a business purpose, one designed to improve the business in some way. This even includes a situation where a business owner or investor engages in a conversation with their spouse or significant other at dinner and runs things by them. For example, I used to be married to a music teacher who had no interest in business. Yet I could bounce things off of her that I could never bounce off of any of my partners because she offered a completely different view and perspective. She would give me feedback that was very valuable and my business received the deduction. So what is the IRS really looking for with respect to this deduction? Documentation is key. The best way to do this is to write a brief note regarding the purpose of your conversation. Write it on the back of the meal receipt. I’ve heard that alcohol shouldn’t be included in this? Actually, alcohol is generally permissible, although it would probably look a bit fishy though if you purchased a $500 bottle of wine for two. The key here is that if it’s a reasonable expense, then you’re good. But what if you are not sure whether something is deductible or not? I take the position that it’s far easier to ask for forgiveness than it is to ask for permission. The reality is that if the deduction has a business purpose and is ordinary and necessary, then it is in all likelihood deductible. ‘Ordinary’ means that is typical in your business, while ‘necessary’ means that it’s needed in order to increase the revenue or the value of your business. That’s all it has to be. It could even be a trip to Hawaii, as long as it meets those requirements. What states have the most favorable balance of business and personal tax advantages? Wyoming, Nevada, Florida and Texas all rank high here. Taxes do dictate where people live and work. As an example, many who live at Lake Tahoe choose to live on the Nevada side for the tax advantages. Or they live in Reno and commute. Or they may have a residence in Nevada and commute to California. In fact, we have a client who paid for his beach house in California from all of the tax savings he accrued from living in Nevada. In general, most people will find that living in a less expensive place will end up putting more money in their pocket. This is especially true in today’s world with the Internet and flights on low-costs carrier for commuters. What’s your crystal ball prediction in terms of our prevailing U.S. tax system and where it’s headed? The biggest thing I can say here is stop thinking that the tax system is going to change any time soon, because it’s not. As long as the government believes that tax incentives are an efficient way to encourage certain activities, chances are that the tax system will remain the same. Sure you hear some noise from time to time from proponents of the flat tax, but I don’t believe that’s going to happen. Besides, it’s a regressive tax. So people who pay less tax now would end up paying more tax under a flat tax system. So why should people run out and get a copy of your book and read it? 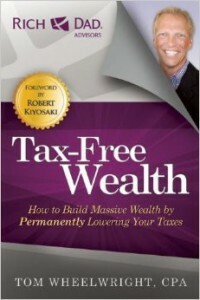 Tax Free Wealth is a fun, easy and understandable tax strategy guide for the average person. It follows the premise that the more you know, the better you’re going to do financially. We took all of the tax strategies we use at our firm, made them very simple and put them in the book. So I invite you to read it and then pass it along to your tax advisor. You’ll discover so much about how tax law is just a series of incentives, largely for the benefit of entrepreneurs and investors.